You wouldn’t expect a history of Dodge muscle cars to be produced by a UK publisher and with an UK author, but here we are. 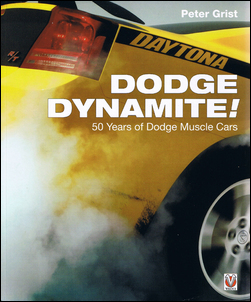 Dodge Dynamite – 50 Years of Dodge Muscle Cars has just been launched by Veloce Publishing. As is the case with all the recent Veloce books, the quality of presentation is high and the editing is poor. Typos and lame phrasing abound – but to be realistic, most people wouldn’t notice or even care if they did. As the title suggests, the book covers cars way back to the 1950s, and for me at least, they’re the most interesting pages. There are plenty of contemporary photos and ads, the latter being especially fascinating. ...trumpets one ad showing a 1953 Dodge almost visually overwhelmed by an artist’s impression of the engine. Here’s how Dodge gives you NEW MASTERY ON THE ROAD! ...says another ad, also for the 1953 model. For a reader ignorant of US models of the time, the publication also fails to place the Dodge models in context – how did they compare with their main opposition? The book skirts past the dismal period in the 1980s where Dodge performance became worked-over Japanese turbo cars without much grunt; the return to power with cars like the Viper re-ignites the pages. Anyone heavily into Dodge performance should have this book on their shelves but it’s also a welcome addition for those interested in the genesis of America’s post-war love affair with big V8 power – and a fascinating look at when copywriters produced ads that were creative and fun. 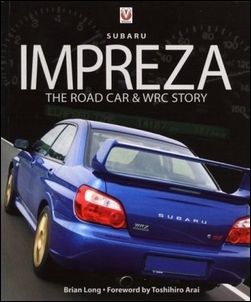 The Subaru Impreza The Road Car & WRC Story is a detailed and interesting 224 page book on the life and times of the iconic Subaru Impreza. As a Subaru owner I was particularly keen to see how much this book held me while reading it and how much information I found truly interesting. Brian Long (resident in Japan) writes clearly and concisely, dividing the book into informative chapters on the life of the Subaru. The book kicks off with some background on the manufacturer (Fuji Sangyo Co Ltd in the early days), highlighting the evolution of the company from its time spent developing aircraft and engines to power them, and the first wheeled vehicle they ever produced – a 135cc scooter called Rabbit – made with wheels left over from their aircraft manufacturing! From then on the writer plunges into the development of the P-1, the ancestor of the Impreza, and the development of Subaru philosophies in manufacturing and the iterations of the Impreza through to, and including, the 2003 model year. Each chapter traces a part of the marque's history as a production vehicle (including STi versions), including many colour photos, technical specifications of the models as they were produced at the time (including differences found in other country's specifications), pricing and production volumes. You certainly aren't left wanting for information, and the narrative style of writing helps you enjoy the read as you attempt to digest all of the information presented. Particularly enjoyable is the ability to reminisce about the history of the Impreza in world rallying. Every stage of the Impreza's development (and often triumphs) in the world rally championship is documented alongside production timelines with full colour photographs and statistics. Chockfull of high quality colour images, mountains of information about each vehicle specification and written in an easy to read fashion, I found this book to be an enjoyable read and a great reference too. Some people may not care for the detailed production volume and specification information, but it is all there if you want it. 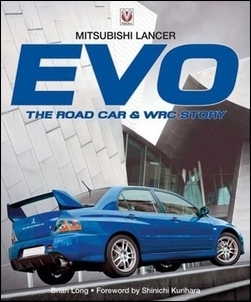 The Mitsubishi Lancer EVO – The Road Car & WRC Story is written by Brian Long and is published in the same series as the Subaru Impreza – The Road Car & WRC Story. It is even a matching 224 pages. Along with the Impreza book, the Mitsubishi EVO book is filled with colourful images and detailed information on the EVO cars from the original Lancer 'Evolution' right up to and including the 2003 model year. The history of Mitsubishi is covered in the first chapter, with foreword by Shinichi Kurihara, Product Manager of Mitsubishi Motors in Japan. Brian has obviously researched the company and vehicle history thoroughly, using many factory and press images from years past to highlight each model and each WRC successor. Pictures of Tommi Makinen (and the EVO model monogrammed with his name), Richard Burns and other rally stars help stir nostalgia for EVO fans. Even included are tables of WRC results reminding the reader just how successful the EVO Lancer has been in world rallying. The development ideals of the Lancer are conveyed often in the book and referenced during chapters. In the chapter covering the fifth evolution of the Lancer there is a brief Q & A interview with the Lancer Chief Engineer in which he details some of the development objectives of the EVO 5. Development goals are further highlighted with mention and quotes from other Mitsubishi staff sources. As with Brian's book on the Impreza, this book includes a huge number of detailed press, marketing and factory images, detailed information on the specifications and production data of each model, and is written in an easy to read and interesting style. Even as just an admirer of the Mitsubishi Lancer EVO, and not an owner, I found the book a rewarding read. It would be a great reference item for a Lancer owner. 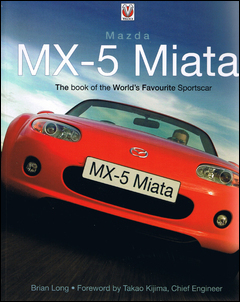 In terms of popularity and impact, there’s never been another sports car like it and Mazda MX-5 Miata – the book of the World’s Favourite Sportscar recounts the story well. Another from the prolific keyboard of Brian Long, this book is a cut above Mr Long’s other books. The genesis of the MX5 is told in detail, with key players described, numerous design studies and clay models shown, and the risks and rewards of the sports car concept fully explored. The three key MX5 models (up to and including the current one) are described in detail and there are numerous photos and diagrams, including ones of the suspension, engine and body in white. As with Mr Long’s other model histories, this is not a technical history – which is a bit of a pity since the MX5 redefined handling with what, after all, are pretty basic underpinnings. An analysis of what makes the suspension work – in terms of roll stiffness, scrub radius, dynamic camber change and the like – would be fascinating... although perhaps not to numerous readers. Every one of the special models is covered – and there have been a lot. Sales performance in Japan, Europe and the US is described on a year by year basis and there’s an extensive chapter on aftermarket modifiers. In short, if you’re an enthusiast of the MX5 Miata, or are simply interested in the detail on a truly significant car, this is a must read. The publisher provided the books gratis for these reviews.